Villa Dianella, Alto Garda Ledro, just a dream! IN WINTER MAXIMUM 5 PEOPLE. 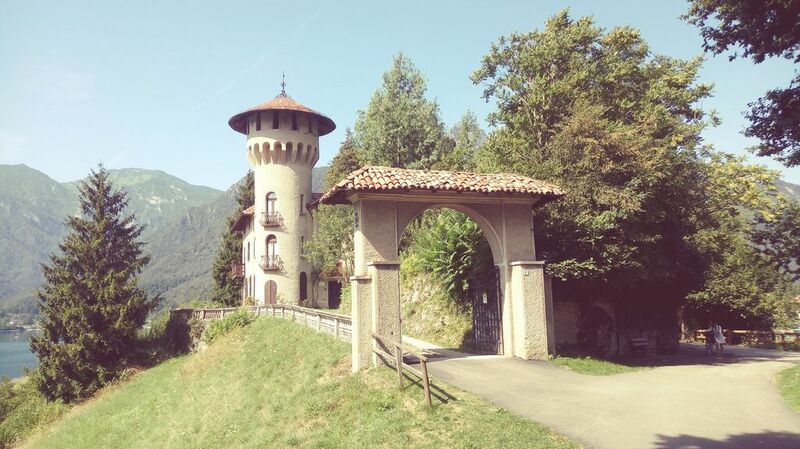 The Villa Dianella is 'the castle', historic home from the 900, has a unique charm, in a privileged position overlooking the lake of Ledro. It offers the widest part of the castle that overlooks the lake. On the ground floor is a study, a dining room and a living room with fireplace (pellet stove and TV), bathroom and kitchen with exit to the garden. A staircase leads to the first floor where there are two double bedrooms and a bathroom, a spiral staircase leads up to another level of the castle, where there are another two double bedrooms and one single and two bathrooms. Surrounded by a park with old trees the 'castle Mezzolago' has a unique charm and romantic. Private parking delimited, WiFi, TV with decoder europeoampio garden and woodland. The property is certainly quirky and the view from the terrace down to the lake and over to the mountains is spectacular. Internally everything you need is there, a little tired for a property of this price, but not unexpected. There is a small local grocery store open until noon for morning bread and fresh fruit and salad. All three of the local villages, Mezzolago, Molina and Pieve are within easy walking distance and offer good places to eat. We enjoyed the local hotel restaurant in Mezzolago. Thanks so much David for your kind words. Das Feriendomizil "La Dianella" ist sehr empfehlenswert. Das Haus ("Das Schloss") ist zwar alt, aber in gutem Zustand. Bei gutem Wetter hat man einen super Ausblick über den See, man kann alle Mahlzeiten draußen einnehmen. Lediglich das Geschirr lässt für die Anzahl der Leute (wir waren acht Personen) zu wünschen übrig. Die Betreuung duchr die Agentur vor Ort war ebenfalls sehr gut. Alles in allem sehr empfehlenswert. Das kleine Schloss ist wunderschön. Lorenzo ist sehr hilfsbereit und jederzeit ansprechbar.